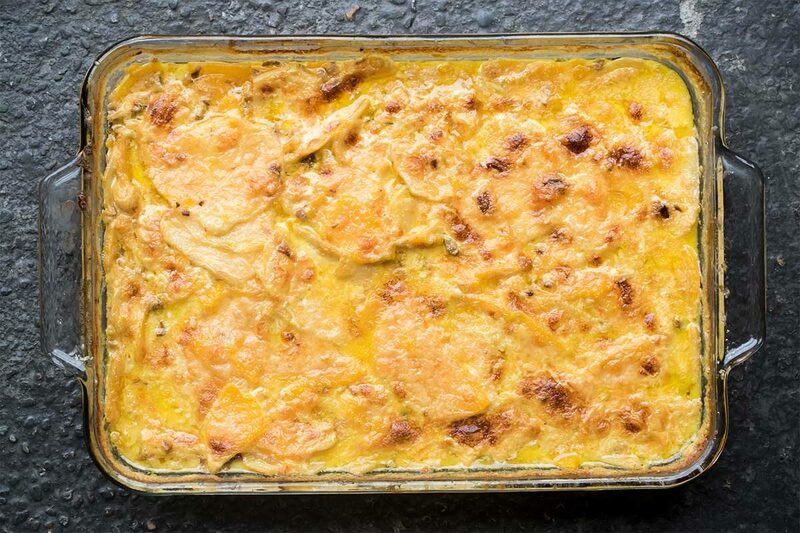 Rich, creamy, cheesy & packed with umami – this gratin replaces humble potatoes with a blend of celery root & butternut squash slices. The secret ingredient – wild porcini mushrooms – really takes this recipe in an interesting direction, adding earthy depth that pairs beautifully with the flavors of the squash, parmesan & herbs. Peel the celery root & use a mandolin to slice it 1/8th of an inch thin. Store it in water with a little vinegar or lemon juice (to prevent browning) while you work with the squash. Peel the butternut squash, halve it & deseed it. Slice it 1/4 inch thin. Pour the heavy cream into a deep pot over medium heat with the bay leaves, salt, pepper, and porcini soaking liquid. Tie the thyme and sage together into a bundle with butcher’s twine & add them to the pot. Drain the water off the celery root & add it to the pot along with the butternut squash slices & parmesan rind. Bring the cream mixture to a boil, then reduce it to a simmer, stirring the slices occasionally so that they cook evenly. Cook for about 15 minutes. While the celery root & squash slices are cooking, finely mince the rehydrated porcini mushrooms. Stir them into the cream mixture once the 15 minutes of simmering are up. Pour the gratin mixture into the baking dish. Remove & discard the herb bundle, bay leaves & parmesan rind. 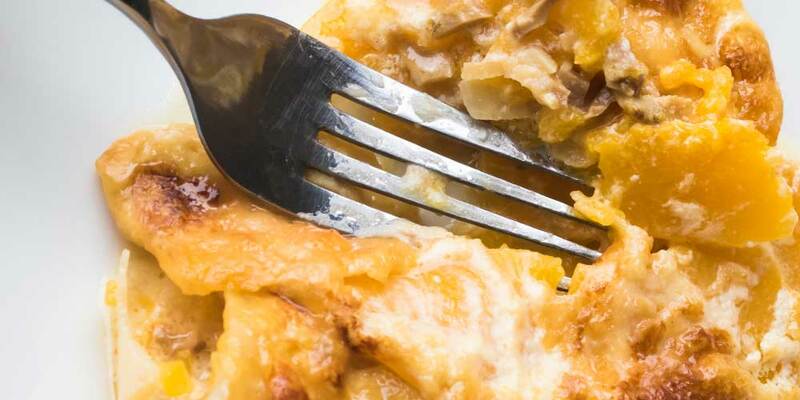 Gently spread the gratin mixture into an even layer, then top it with the grated parmesan. Cover the dish with foil. Move it to the oven & bake for 20 minutes. Remove the foil & bake for an additional 25 minutes. Carefully remove the baking dish from the oven & let the gratin cool until it’s safe to eat and has set up a little bit. Scoop out portions & serve.